MSR is a leader in backcountry safety and a brand trusted by outdoor enthusiasts and pros alike. In this post MSR lays out the history of their unique avalanche probes. Learn about how their technology has evolved to provide you with the best tools to navigate the backcountry safely. 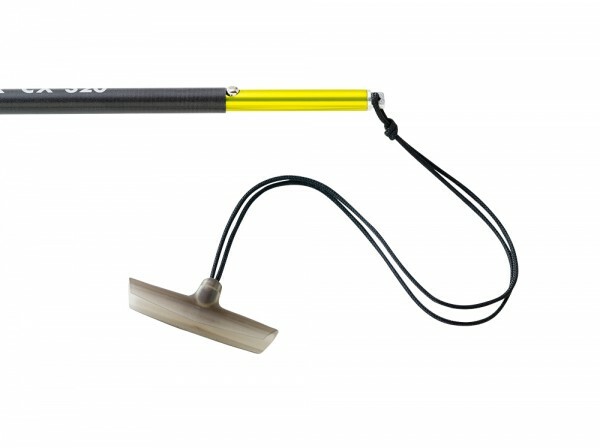 Do you work in the outdoor industry and need to carry a probe for your job? Pros can shop MSR at pro price on Outdoor Prolink. Forty years ago, before snow science was standard practice for the typical backcountry traveler, probes were primarily used in avalanche rescue situations to help locate buried skiers or climbers, as well as by mountaineers to detect voids, crevasses and other hidden dangers lurking beneath the surface of the snow. 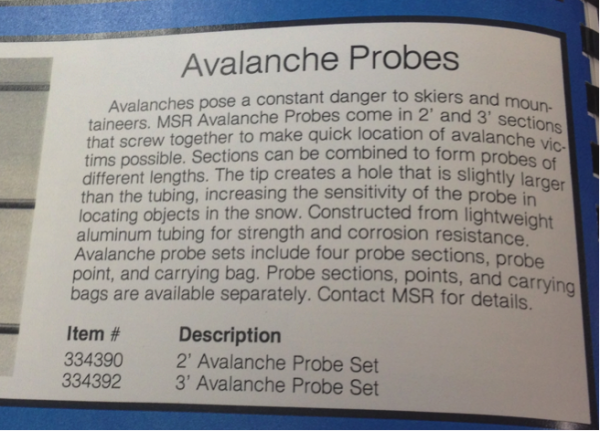 Some of the earliest MSR avalanche probes were sold in 1974 through MSR founder Larry Penberthy’s Mountain Safety Research newsletter. 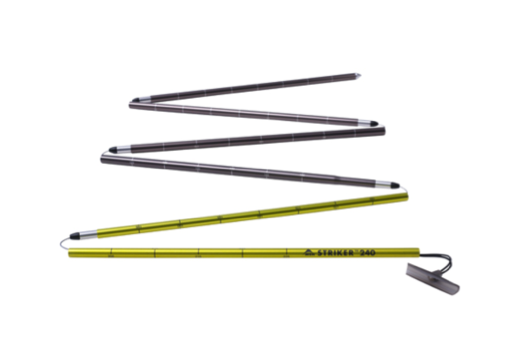 The newsletter archive describes these early jointed aluminum alloy probes (5/8” diameter) as “the most rigid and light weight of any probe we know.” The 6-foot long MSR Avalanche Probe sold for $6.55. 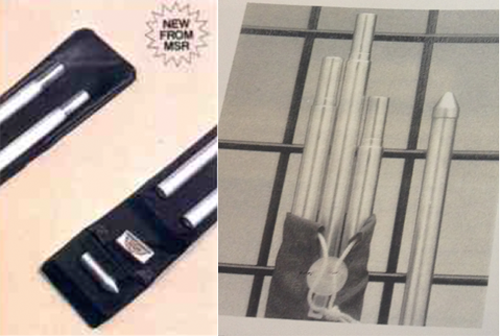 In 1981, MSR introduced the Avalanche Probe Set, consisting of four 2-foot or 3-foot sections, a probe point, and a special storage sack with a dedicated probe point pocket. Several years later in 1989, the newsletter—which was also dedicated to safety education—took pains to elaborate on the probe’s design and function: MSR stopped offering probes for a period of time. But this season, we reintroduced probes into the MSR snow tools line, along with snow shovels and snow saws. Engineered for everyone from professional mountaineers to snowshoe recreationalists, the collection is meant to help you build your backcountry safety kit with gear that delivers unrivaled efficiency and reliability when you need it most. MSR Striker™ ProbesSimilar to our approach with the MSR Fluke that we introduced a couple years ago, we wanted to create with our Striker probes a truly innovative design—not just another “me-too” product. Our design evolved from what we saw as an unsatisfying choice in the current market between probes that were ultralight and those that were ultra stiff; we thought an ideal probe should be both.In a rescue situation, after an avalanche transceiver has led you near to where someone is buried, it’s imperative to have a laterally stiff probe that minimizes splay or deflection in variable snowpack, so you can quickly zero in on the person through consistent probing. But it’s also important for a probe to be lightweight, because it must live in your pack at all times. The probe is an essential piece of equipment that you hope you’ll never have to use, but one you always need to carry. With these needs in mind, we took up the challenge of making a design that was both stiff and lightweight, leading to the very first variable thickness probes. 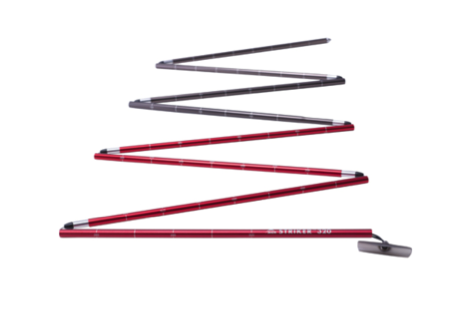 Made of strong 7000-series aluminum, the critical lower sections of our two probes feature a larger 13mm diameter and a thicker wall to maximize stiffness, while the traditional-sized 11mm upper sections save weight, as they do not need to be as thick for the probe to do its job effectively. 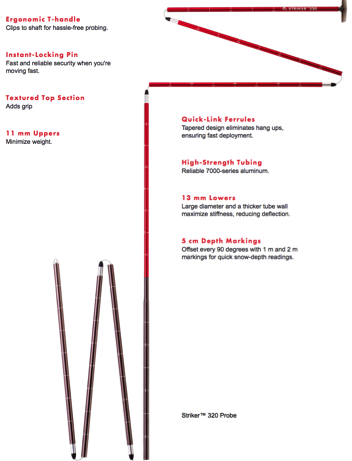 It’s this unique construction that makes our Striker probes among the stiffest aluminum probes on the market, while remaining impressively lightweight. Designed for guides, professionals and dedicated recreationalists, the Striker™ 320 probe is a professional-length, reliable probe with the strength and stiffness for tackling deep snow packs and aiding search-and-rescue operations. The shorter Striker™ 240 probe offers skiers, snowboarders and snowshoers reliable probing accuracy in the backcountry with its ultra-stiff, deflection-reducing lower sections and its exceptionally light and packable design. It’s ideal for average snow packs. 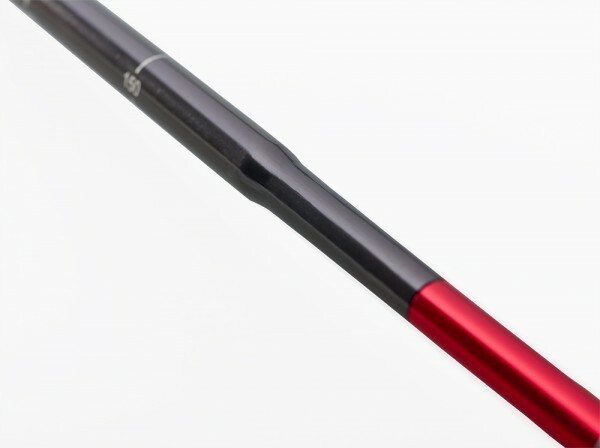 For quick deployment, the Striker probes use a T-handle that’s easy to grasp and get leverage on, and tapered ferrules on each probe section that allow the sections to link together quickly without any hang ups. In addition to designing a stiff and lightweight probe that deploys quickly, we created other efficiencies, including intuitive user cues. Color-coding indicates the thick lowers from the uppers, and extremely clear depth markers, offset around the probe, let you read the measurements no matter how the probe is turned. Also, the top section of the probe is textured for added grip and the T-handle clips to the probe so that it’s not whipping about you as you’re trying to move quickly. Finally, we created a stuff sack that even those who don’t like stuff sacks may appreciate. Made of lightweight Tyvek® fabric and featuring a small magnet closure at the top, the stuff sack helps keep things organized in your pack until you need to use the probe. Then, all it takes is one quick motion to throw open the sack and slide the probe into your other hand for immediate use. Designed to free up weight but to be there when you need it, our Striker probes are built to serve as an essential part of your backcountry toolkit—not just for avalanche rescues, but also to analyze the conditions before you even decide to venture farther into the backcountry. Because the more information you gather on the conditions, the more likely it is that you won’t need to use the probe for what it’s really meant for.